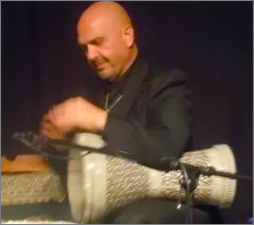 Grammy-nominated Souhail Kaspar, Master Percussionist, is known world wide for his brilliant technique, exciting performances and teaching skills. A true virtuoso, his ability to improvise and embellish the rhythmic patterns of Arabic music, as well as his knowledge of ethnic musical history make him one of the most highly acclaimed performers and instructors of our day. Mr. Kaspar has worked with legendary Egyptian composers Farid al-Atrash, Sayyad Makowi and Hanni Mehanna. He has traveled extensively during his career and has performed with artists John Bilezikjian, Kenny Burrell, Omar Faruk, Shujaat Khan, Kronos Quartet, Cheb Mami, Dr. Scott Marcus, Roberto Miranda, Tito Puente, The Sacramento Symphony Orchestra, Kathem al-Saher, Simon Shaheen, Sting, Strunz & Farah, Wadi al-Safi and many others. He has also performed for dignitaries such as Ronald Reagan, Pope John Paul II, and the Dalai Lama. Souhail, recipient of the Durfee Music Fellowship given to master musicians and teachers, has worked with Dr. Ali Jihad Racy (renowned UCLA Ethnomusicologist) at a wide variety of cultural events. Together they have performed in major concert halls and taught master classes and workshops throughout the United States. His impressive body of recorded work includes soundtrack credits for the movies The Prince of Egypt, Sinbad and Scooby Doo in Egypt and for the documentaries The Region of the Nile, Darfur Now and The Great Bazaars. He has been featured on many CDs including guest percussionist on Caravan with the cutting edge Kronos Quartet, When the Soul is Settled: Music of Iraq for the Smithsonian Institute (nominated for the 2008 Grammy Traditional World Music Category), The Congo Square Project to provide relief funds for New Orleans musicians, Khaliji and Magic. Arabic Rhythmic Modes and his DVD Foundations of Arabic Rhythm with Souhail Kaspar, Master Class at Home for Egyptian Tablah & Riqq. He has recently completed filming two new instructional DVD’s Intermediate & Advanced Techniques & Rhythms with Souhail Kaspar, Master Class at Home for Egyptian Tablah and Egyptian Rhythm & Movement for Raqs al-Sharqi with Souhail Kaspar Master Class at Home for Dancers & Drummers. Souhail’s signature Egyptian drum line was released in 2007. Currently, Souhail Kaspar lives in Los Angeles, CA, USA. He performs/records internationally, teaches percussion and dance theory as well as coaches professional musicians and dancers in the traditions of Arabic performance. Copyright 2012 Neareast Music. All rights reserved.